At the University College London (UCL) Centre for Gender and Global Health, the renowned Argentine feminist anthropologist Dr Rita Segato recently discussed the impact of colonialism on the social fabric of small rural communities in Brazil. She observed the breakdown of a certain social mind-set, where values of communality, reciprocity, and networks of support were gradually being replaced by individualism and isolation. This, she argued, has led to an environment which is facilitating gender violence by eroding previous communal coping mechanisms, reducing household resilience against violence, and removing significant networks of support for women and men. In the Peruvian Amazon, communities are experiencing a similar transition. The Lower Napo River communities that we are working with for the upcoming GBV in the Amazon of Peru (GAP) Project are negotiating a transition to modernity, where increasing access to transport, telecommunication and media has meant that communal life is changing. This has coincided with increasing concerns about gender violence: recent figures from Mazan, a remote township on the Lower Napo River, show that 79% of women between the ages of 18 and 29 report experiencing sexual violence at some point in their life. 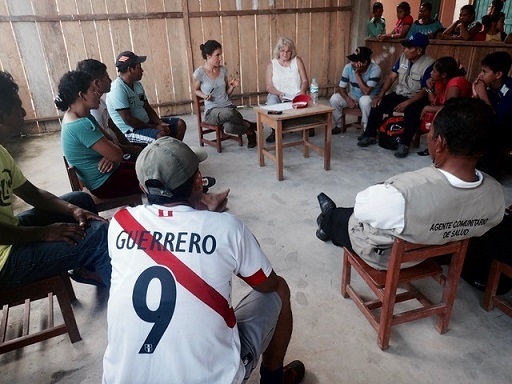 To address these concerns, the community health workers (promotores) are developing a promotor-led community mobilization and education program to target GBV, facilitated by resources from DB Peru, a healthcare charity, and UCL. The GAP Project is the first primary preventative strategy for GBV in the region of the Lower Napo River, and the first community mobilization project of its type in Peru. It is also leading the way in fostering a participatory action research approach to GBV prevention in a low-resource, remote rural setting. Working in this setting has raised many logistical and ethical challenges. Logistically, the GAP Project is set amongst 25 rural communities with severely limited access to services. Secondary or tertiary violence prevention is almost impossible to access: a journey to the local police station is half a day away, and the systems of reporting are difficult to navigate and insensitive to victims’ needs. There are two under resourced women’s shelters and violence support services in Iquitos for the entire Loreto region, but this is a day’s travel away. Even if an individual chooses to report and act on an episode of violence, the question remains how they will afford the often-enormous costs of seeking help, and how they would continue to support themselves and their family if the perpetrator is a crucial component of the family unit back home. These difficulties reinforce the need for primary prevention strategies, such as the GAP Project. These small rural communities have different values and community dynamics, where the division between public and private life is less distinct, community identity is of importance, and relationship networks are complex and intimate. These values require different ethical approaches from traditional biomedical ethics approaches, which uphold autonomy and individuality over communal interest. Furthermore, as Segato notes, the erosion of traditional community functions giving way to more private and isolated family units may decrease overall community resilience to violence and violent behaviours. It is because of these factors that the GAP Project is working to understand in greater depth the values and needs of the 25 Lower Napo River communities so that we can create a comprehensive and respectful ethical framework for our violence prevention project going forward. This is also part of a larger international project to develop guidance on how to conduct ethical, safe and rigorous research on violence against women and girls in small communities where violence is highly prevalent and seen as normal. This month, we are working alongside the community leaders to explore and define the GAP Project ethics principles through a series of community consultations and problem solving activities. During these meetings, we will ascertain community understanding of the definitions of gender, violence and human rights, and will seek consensus on a community-specific ethical framework for the project. To get to this point, we are taking two complementary approaches. First, we are facilitating discussions with community leaders about the project and potential ethically difficult scenarios. For example, we have heard reports of perpetrators of violence who hold positions of power in the community, which brings up many challenging issues. Second, we are running a group prioritisation exercise with community leaders and promotores, brainstorming ethical challenges and concepts relevant to the local context, and refining this list through a process known as the nominal group technique, where everyone has the chance to discuss the issue in an open forum, then vote sequentially on the key concepts which arise. These concepts will then be fed into an overall project guideline, which will allow us to respond to challenges throughout the project cycle through establishing key ethics and behaviour principles. Our aim is to be consistent with positive community values and uphold locally relevant ethical principles. Segato, R.L., 2016. Patriarchy from Margin to Center: Discipline, Territoriality, and Cruelty in the Apocalyptic Phase of Capital. South Atlantic Quarterly, 115(3), pp.615-624.